Technology is rapidly advancing in all areas of business, and no company wants to be left behind. However, it is especially important that treasury and accounting departments keep their technology current since many of these advancements are essential to protecting business investments and maintaining company finances. 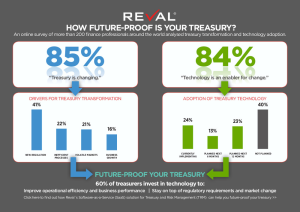 According to a survey of finance professionals, the general consensus is that acounting and treasury departments are changing. Eighty-five percent of poll respondents said that they had noticed a significant change in their own accounting departments, and 84 percent said that technology is one of the major facilitators of change. Reasons treasury departments should consider making significant changes include meeting and adapting to new regulations and overcoming inefficiency. Other reasons to make changes are volatile markets and the needs of business growth.